Brand new for 2011, the Mega-Catch™ Pro 900 Premier XC or so called “transformer trap” is capable of attracting mosquitoes and other biting insects from as far away as 120 feet. 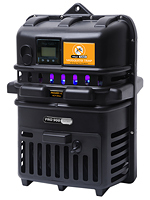 This state-of-the-art machine employs a sophisticated infrared energy source combined with an integrated LED lighting display, which produces light in the visible and invisible spectrum at oscillating frequencies known to attract most mosquito species. An optional upgrade kit (sold separately) converts or ‘transforms’ the Premier XC to top-of-the-line Ultra trap specifications, making it Carbon Dioxide (CO2) capable. While Mega-Catch™ Traps don’t need CO2 to attract mosquitoes, operation of the patented CO2 Gas Attractant System does enable the trap to replicate a key feature of human and animal respiration by releasing or ‘exhaling’ variable amounts of CO2 into the air plume. Mosquitoes then use this air plume to navigate their way to the trap. Use of this system while optional, can increase the capture rates of a wider range of mosquito species by as much as 300 to 400%. 8-12 feet off the ground. I turned the unit on and went back to laying sod.